Ferraretto is a research associate at the Miner Institute; Shaver is a dairy nutritionist at the University of Wisconsin-Madison. The main purpose of ensiling forages is to maintain the nutrients available for future feeding. The four main phases that occur after forage is ensiled are: aerobic, active fermentation, stable and feedout. The aerobic phase starts after harvesting and ensiling, and during this phase, plant and microorganism respiration occurs until oxygen is completely absent in the silo or the supply of substrate is used up. Once oxygen is absent, fermentation starts with bacterial production of fermentation end-products. This phase is characterized by the accumulation of lactic and acetic acids and a corresponding decline in pH. Once pH is low, the silo mass reaches a stable phase. Generally, it is accepted that microbial and plant fermentation ceases and few changes occur during the stable phase. The feedout phase starts after silo opening. Overall, the fermentation phase was thought to last seven to 45 days. However, recent literature suggests that the fermentation process continues for much longer in whole-plant corn silage. The focus of this article is to discuss the effects of extended storage length on nutrient digestibility and corn silage processing score. A pH decline following a gradual increase in lactate and acetate concentrations as silage storage length progresses is commonly observed. This is not surprising if we consider that literature data from the 1960s and 1970s reported the existence of bacterial activity in silage fermented for up to 200 days. However, accumulation of lactic and acetic acid and the subsequent decline in pH are not as pronounced during storage as in the initial fermentation period. In addition, the microbial population may change over the course of fermentation, and the existence of certain bacteria with the ability to convert lactic acid to acetic acid may cause a slight increase in pH. These alterations in fermentation pattern may mask the effects of extended fermentation at the farm level. Nevertheless, although we cannot clearly see these changes going on during fermentation, it does not mean it does not occur and perhaps other indicators of continuous fermentation are needed. Recently, data from Wisconsin demonstrated that ensiling high-moisture corn for 240 days reduced zein-protein encapsulating starch granules, and it suggested that the starch-protein matrix was degraded by proteolytic activity over an extended ensiling period. Zein-proteins encapsulating starch granules impede bacterial and enzymatic digestion of starch in the rumen and the small intestine, which in turn limit starch digestibility and may impair lactation performance by dairy cows. In the same study, an increase in ammonia-N (nitrogen) concentration was observed as storage length progressed. Thus, ammonia-N was used in combination with mean particle size for modeling the effects of corn maturity, moisture content, and extent of silage fermentation on ruminal and total-tract starch digestibilities for high-moisture corn at feedout. 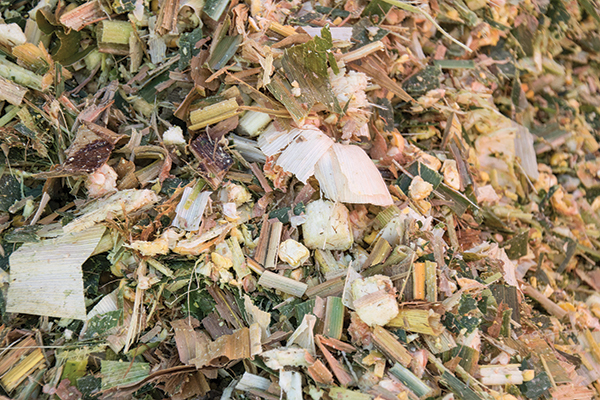 The experiments evaluating extended corn silage ensiling time observed a gradual increase in soluble crude protein (CP) and ammonia-N concentration as fermentation progressed. Perhaps ammonia-N and soluble CP may be used as indicators of continuous fermentation and zein-protein breakdown in future models. Research trials on the effects of ensiling time on ruminal in vitro starch digestibility of corn silage are summarized in the table. At 30 or 45 days of ensiling, starch digestibility was increased by 7 percentage units on average and is likely related to the fermentation phase, which typically occurs in this time frame. Interestingly, however, all five trials showed a gradual increase in starch digestibility after 30 or 45 days of additional storage, suggesting that starch digestibility may increase during the stable phase. Proteolysis, the main mechanism responsible for the disruption of the zein-proteins cross-linked to starch granules, occurs under acidic conditions suggesting that continuous alterations in fermentation profile as storage progressed may directly affect starch digestibility. First, bacterial activity continues even after fermentation reaches the stable phase. Second, the activity of plant proteases specific to the endosperm of cereal grains is greater under low pH conditions. Combined, bacterial and plant proteases are responsible for 90 percent of the increase in soluble CP concentration, according to a recent study from Brazil presented during the XVII International Silage Conference. Although allowing an extended ensiling period may be beneficial for increasing starch digestibility, research does not support the same fate for neutral detergent fiber (NDF) digestibility. Overall, data from several sites across the U.S. demonstrate that extended storage does not change or slightly reduces NDF digestibility in corn silage. During the American Dairy Science Association Joint Annual Meeting hosted in Orlando, Fla., this past summer, we reported on two experiments evaluating the effects of ensiling and ensiling time on corn silage processing score (CSPS; percent of starch passing through a 4.75 mm sieve). The first experiment compared unfermented versus 30-day fermented corn silage samples harvested with varied processors and settings. Overall, a 10 percentage unit increase in CSPS was observed after 30 days of fermentation. The second experiment evaluated ensiling time effects on CSPS. Similarly to what commonly happens to starch digestibility, ammonia-N and soluble CP, a gradual increase in CSPS was observed from 0 to 240 days of fermentation (see graph). The extent of increase in CSPS, however, was lower than in the first experiment. Further research is warranted to evaluate if the magnitude of the CSPS change as fermentation progresses is dependent upon the initial values of unfermented samples. These findings highlight the potential effects of extended fermentation not only in chemical but also physical characteristics of kernels. In summary, research supports the use of inventory planning so a newly harvested crop would be fed only after four months in storage. Although prolonged storage of corn silage would be a valid management practice, it requires proper silo management during filling, packing and covering to ensure beneficial fermentation patterns. This article appeared in the January issue of Hay & Forage Grower on page 6.